Hi there! It's the last day of May and I have mixed feelings about this day...it is my youngest son's high school graduation. Where did the time go? Sniff! Sniff! I created a scrapbook page for him using a couple of stencils from two sets - Stencils 10ct 101 Collection and Stencil 10ct 201 Collection. I love to make art. I love to experiment. I love to play. Books, sheets of paper, canvas, cards, crates no matter the surface, if there is space, there is a place to play. I am in! However, books hold a special place in my heart because you get to experiment and you can simply close the book to others eyes, if you want. You have a record of your art and your progress all in one neat spot. Shading can be intimidating to those new to the process, so I can drafted an easy to follow Snapguide to show you step by step how to do it to make this simple flower. Stenciling is such a wonderful technique with so many possibilities. It's Julia Stainton here today with a project that puts a spin on stenciling and has a great touch of glam. There's so many different surfaces that you can stencil on. Most often I use paper but you can also stencil on fabric, canvas, wood and actually almost anything. I've been wanting to try stenciling on transparencies but not every medium is suited for adhering itself to the slick plastic surface. The new Texture Luxe™ from Faber-Castell Design Memory Craft® is a wonderful product and I couldn't wait to try it out and see how it worked on the transparencies. Have you ever seen a craft where you love the detailing, but you aren't sure how to make it? Tonight's class with designer Jen Matott will have you making mixed media canvases like a pro. We're also giving away prizes tonight so don't miss this class! Hi everyone! Laurel Beard here today with you to share how easy and fun it is to color with the Design Memory Craft ® Art Grip ® Aquarelle watercolor pencils. I am pleased as punch to be guest designing over here for a few months!! The entire Design Memory Craft® line is amazing! All the products are designed to mix and match so you can really have a lot of fun with them... And it's a great investment... Here's the card I made for today. Hi! Irit here with a new colorful project using my favorites, the beautiful Gelatos®. I started by adding some washi tape to my patterned paper and priming the paper with gesso. I then picked a rainbow of colors, beautiful happy colors! Hi there! It's Riikka here sharing another guest project with you! This time I went playing with Chalk Board Paint, Gelatos® and Texture Luxe™. I was intrigued to try the Gelatos® on the Chalk Board Paint, how they would mimic chalks on top of the paint and how the colors would shine from the black surface. What also shines from black is the Texture Luxe™. I used the silver one here in my layout and created a twinkling background for my page. Texture Luxe™ is thick enough to be used with a stencil for a dimensional effect. And the shine it has is just awesome! The paste is smooth and silky and the end finish really shines. As the paste has some tooth too, you can use it in a way of adhesive - please see the video below to learn what I mean! The topic of the page is like the title suggest movie magic. Don't you just love the feeling a good movie gets you into? When you leave the theater and are still captivated by the story, the visual aspects of the movie and well, the movie magic? I don't go to the movies as often I would love to, but even more I then enjoy the feeling after seeing something captivating! It almost feels like you are in the story when you are heading home at best. The page has three different type shine on it. There's the sparkling, high shine of the glitter, the satin like shine of the Texture Luxe™ and then silk like sheen of Gelatos®. Talking about star shine! I also added bokeh styled little dots here and there around the page using Stamper's Big Brush pen - one of my favorite things to do lately! Thank you for stopping by today! I hope I have inspired you with my project! Until next time! Hi! Kimberly New here. Today I'll be sharing my altered balsa box. Hi everyone! 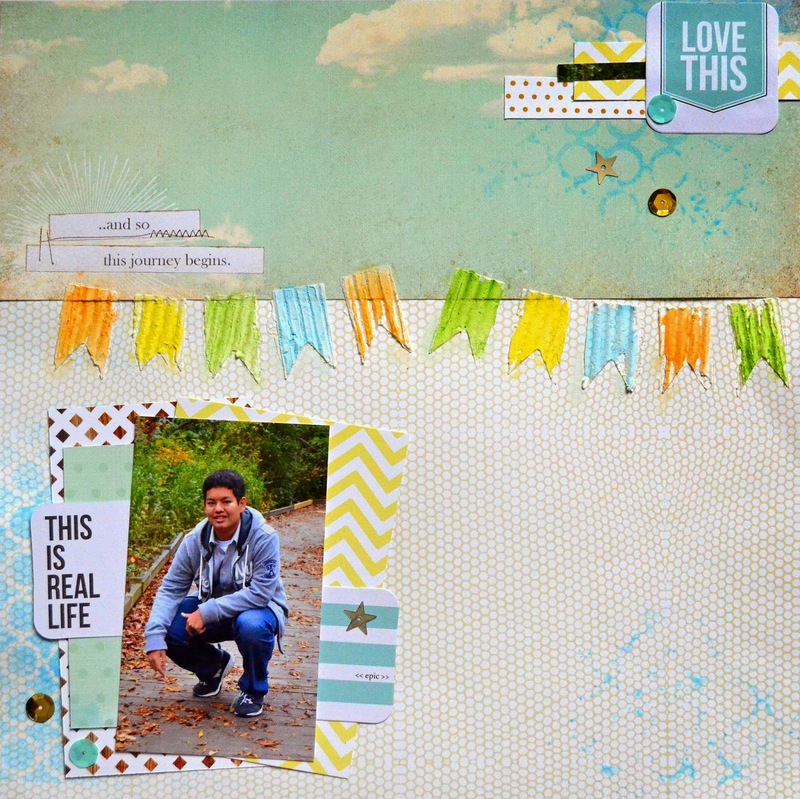 Lisa with you today to share a few fun ideas using the Texture Gems™ (and a few other awesome products) on a black tag.